The years after the 1832 general election saw a number of large changes in UK politics, though not all of them permanent. The Tory Party had transformed in 1834, becoming the modern Conservative Party. 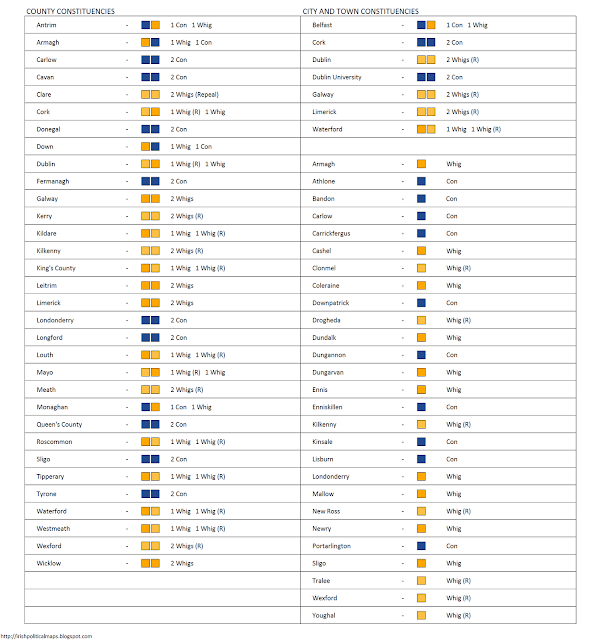 The Whig Party, meanwhile, agreed to an electoral pact with the Irish Repeal Association, whereby members of the latter would run as Whig candidates in the next election. The 1835 election was therefore fought only between the two main parties, both in Great Britain and in Ireland. 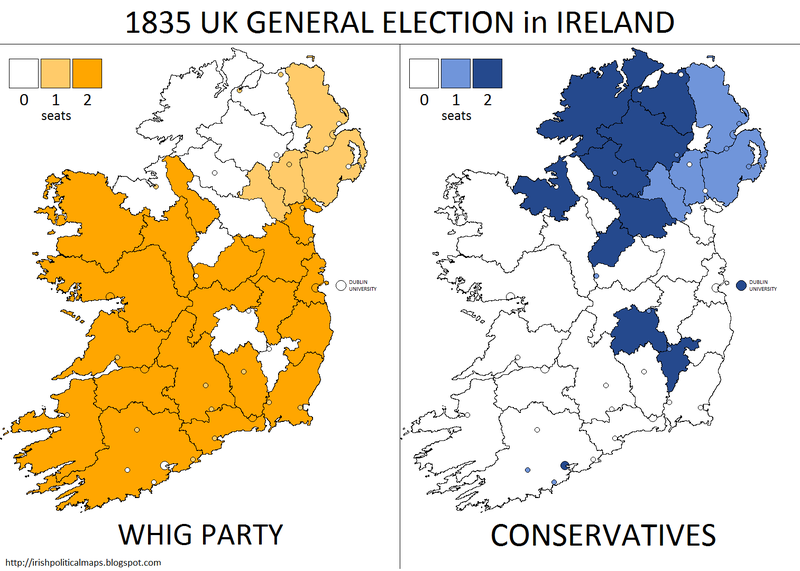 As was expected, the Repeal-Whig pact resulted in generous results for the Whig Party in Ireland, which won both seats in county constituencies everywhere but Ulster and some parts of Connacht and Leinster. The Conservatives kept the strong Tory vote in west Ulster, drawing even with the Whigs in the east of the province. A Conservative loss in Galway was offset by large gains in Longford, Queen's County (Laois) and Carlow, where the party won all of the county seats. 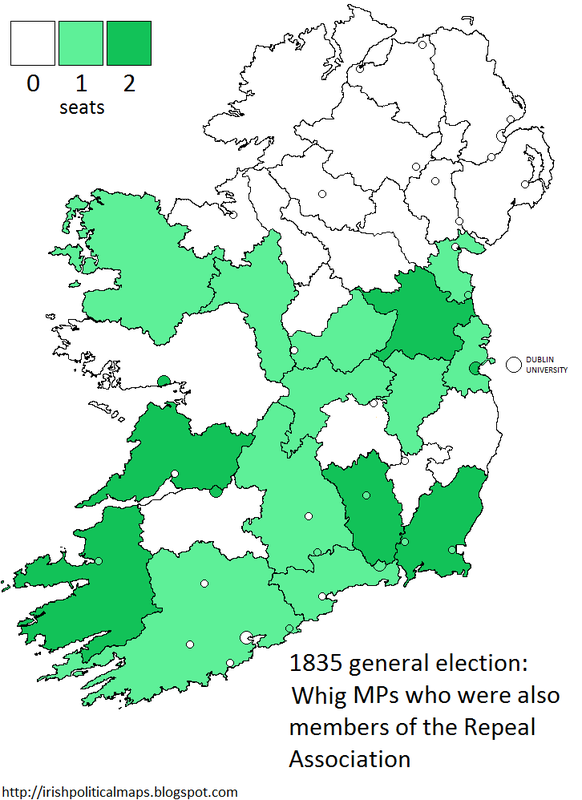 In Carlow, this result was disputed and a new writ was issued: the Whigs were subsequently elected to both seats. In an upset for the goals of the Repeal Association, the incumbent Whig government lost 56 seats and was replaced by a new Conservative government led by Robert Peel. The Conservatives were as uninterested in Irish withdrawl from the Union as the Tory Party had been, and so the issue looked likely to remain untouched for the time being. Peel's government was a minority administration, however, which quickly resulted in the Conservatives leaving government just two months after the end of the election. The Whigs, led by the Viscount Melbourne, formed a government instead and so the members of the Repeal Association sat on the government benches once more. 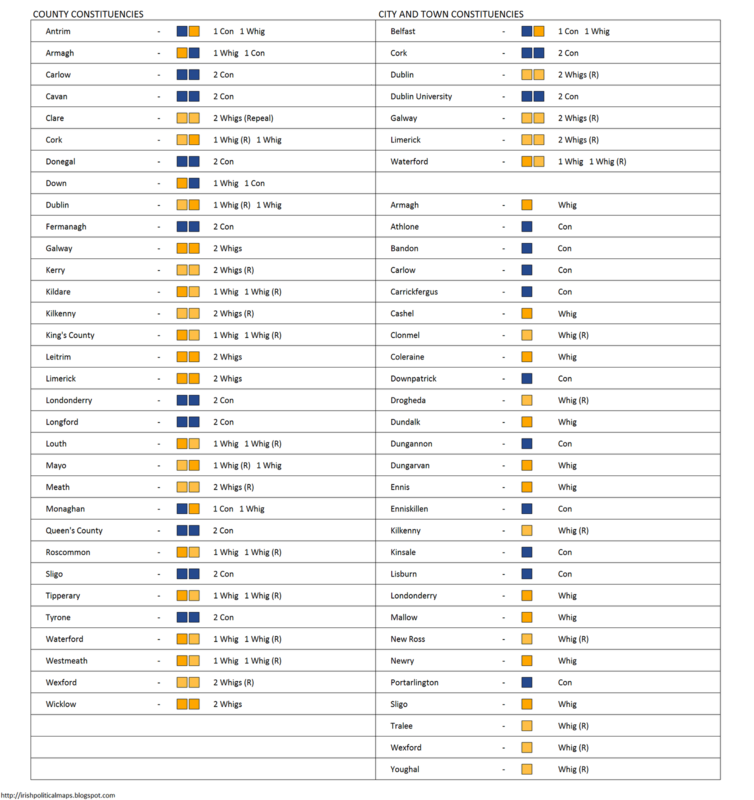 Click here to see the constituencies used in this election.